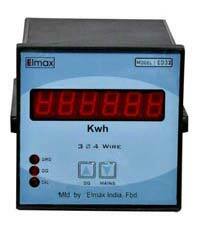 Elmax makes model ED32 is a Single/dual Kwh Meter with panel mounting. The dual version reads power consumption from DG and Mains separately and displays the readings of the running source. The readings on other source can be seen by pressing the front panel keys. Meter is provided with direct load up to 60 amp with max demand settings and RS 485 port. Single Kwh Meter is available in LED display. The meter is designed at par with international quality standards.